A nearly full field of 13 sophomores will head postward in the 81st running of the Santa Anita Derby (GI), which has been carded as Saturday’s eighth race at the Great Race Place and will go off at 3:30 PT. The rather large field is filled with runners who otherwise we’d logically expect to avoid a prep with such significant Kentucky Derby (GI) implications, but with the injury to the West’s division leader, Mastery, in the San Felipe Stakes (GII) last month, hopeful connections are coming out of the woodwork to run in this $1 million event. In 2014, subsequent two-time Horse of the Year California Chrome won Santa Anita’s top prep before wearing the garland of roses in Louisville. And, in 2012, I’ll Have Another was victorious, joining a list of winners that reads like the Hall of Fame plaque — A.P. Indy, Sunday Silence, Winning Colors, Affirmed, Majestic Prince and Swaps. Other names to have started in the nine-furlong test include board-hitters Pioneerof the Nile, Point Given and Free House, as well as off-the-board runners Silver Charm, Giacomo and many more. After winning last year’s Santa Anita Derby, Exaggerator went on to finish second in the Kentucky Derby and upset Nyquist in the Preakness. Exaggerator romped to a 6 ¼-length victory in the slop a year ago before finishing second in the Kentucky Derby and winning the Preakness Stakes (GI). This year rain is forecast again, but hopefully the morning showers expected will give way to clearer skies by post time. San Vicente Stakes (GII) winner Iliad is the early favorite off his runner-up finish to Mastery in the San Felipe last time out. Making his third start for new trainer Doug O’Neill, Iliad appears to have all the goods to win here. The bay son of Ghostzapper and the You and I mare Little Swoon is bred for the distance (and even farther) and has been training extremely well over the surface. Leading rider Flavien Prat will be back aboard the handsome ridgling and it’s a good bet to expect a typical stalking-the-pace trip. While his mid-90s speed numbers are just OK in the grand scheme of things, they make him a tough customer in this field. Hall of Fame jockey Gary Stevens seeks his 10th Santa Anita Derby victory aboard Jerry and Ann Moss’ Royal Mo, who will break from the far outside. While the post doesn’t appear to be ideal for the colt, who picked up his two career victories in frontrunning fashion, he did close from way back to place in his second career effort and, according to trainer John Sherriffs, has been training to sit off the pace. In his last, a ninth-place finish in the Rebel Stakes (GII) at Oaklawn Park, he never picked up his feet to be competitive for whatever reason, so he’s now home in an effort to replicate his Bob Lewis Stakes (GII) victory and get some confidence should he head to Louisville. He’s earned some strong speed and pace numbers and is absolutely bred to love the added distance, so all Royal Mo may need is a traffic-free trip. 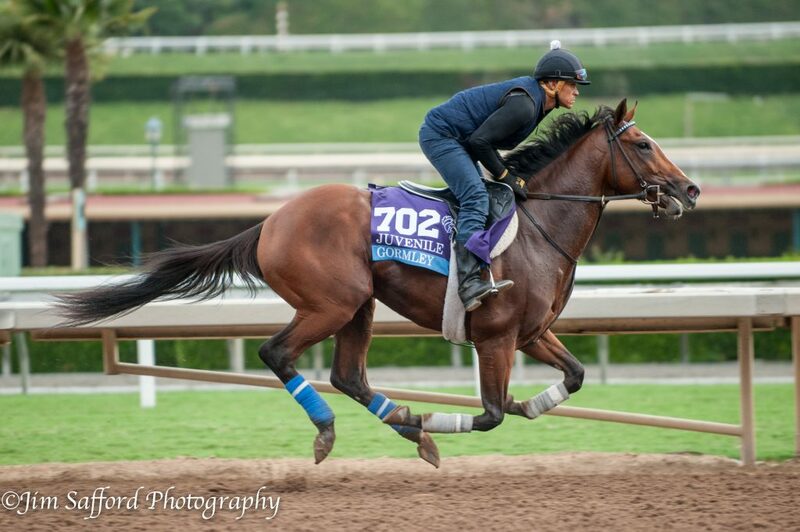 Royal Mo’s stablemate, Grade 1 winner Gormley, is back after a fourth-place finish in the San Felipe last out. A couple things happened that day: 1) He was facing a solid runner in the winner (Mastery) and it was an unusually hot day in Southern California and 2) He was overheated before the race even started. Now, with cooler temperatures expected and some decent works over the track, his connections are hoping for a better result than last out. Victor Espinoza, who is a master on the front end, will be back in the saddle on the son of Malibu Moon, so expect the pair to break well and head right to the front from post position nine. A repeat of his Sham Stakes (GIII) score makes him the runner to beat here, simply by looking at his speed, pace and class numbers. He’s also a winner over an off track, having taken the Sham in the slop, so it may make sense to give him a longer look if the surface hasn’t dried out substantially by the race’s post time. Gormley (photo by Jim Stafford). 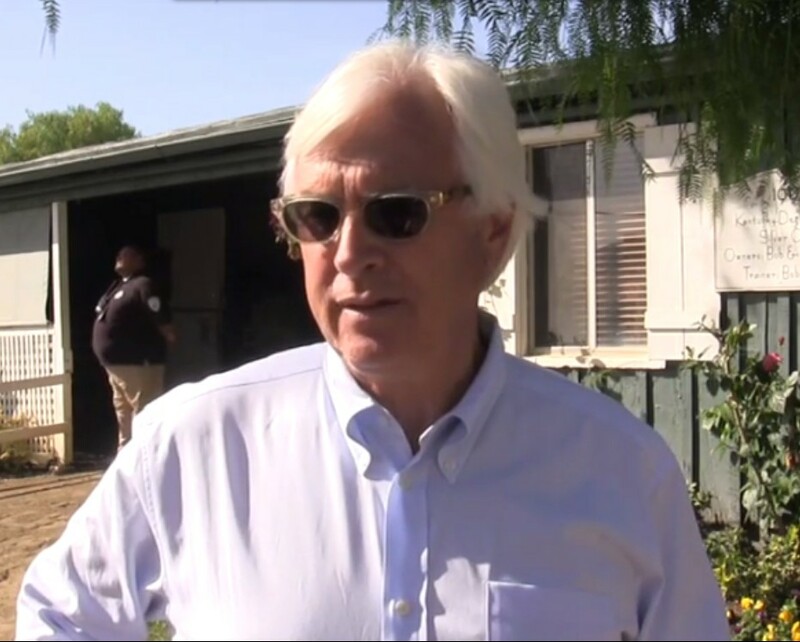 Hall of Famer Bob Baffert seeks his seventh winner in this event and has sent in a small army of three in his effort to accomplish the task, led by Sham Stakes runner-up American Anthem. After a dismal tenth-place performance in the Rebel Stakes (GII) last out, many believed the son of Bodemeister would be yanked off the Triple Crown trail. But when he came out of that effort in top shape and his connections found he’d lost a shoe that day, it was back to the drawing board with him and now he’s back in search of valuable Derby points. He’s been training especially well over the surface since that race, including a bullet half-mile work in :46 4/5 last week, and Baffert’s stable rider Martin Garcia gets the call for this nine-furlong test. He seems to have some tactical speed to go along with his untapped potential, a major positive in this race where the early pace could be quick. If he runs back to his second in the Sham, he looms a serious threat. Battle of Midway steps back into stakes company after a third in the San Vicente (beaten eight lengths by Iliad) and, then, a nice neck win in a first-level allowance contest a month ago. Corey Nakatani picks up the mount on the Jerry Hollendorfer trainee and while he’s loaded with pedigree (Smart Strike – Rigoletta, by Concerto) and talent, this is most definitely his acid test and he will need to be right there at the wire to be considered a legitimate Kentucky Derby threat. Bob Baffert hopes that American Anthem will rebound in the Santa Anita Derby after a dismal showing in the Rebel Stakes at Oaklawn Park. Baffert’s second runner is maiden winner Reach the World, who was second last out to Batttle of Midway. It looked like he ran out of room that day, so the extra sixteenth of a mile should only help his chances. He’s improving with each start, so maybe just a little more under Baffert’s go-to stakes jockey Mike Smith is all it will take. Irish Freedom is Baffert’s third runner here and was fifth behind Battle of Midway and Reach the World in his last race, which was his first against winners and followed a long break. He’s done something in the mornings to make his trainer believe he belongs here in just his third start and his six-furlong work in 1:12 1/5 two days ago was exceptional. 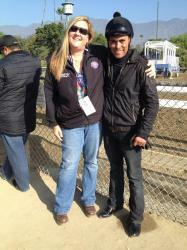 Rafael Bejarano, who was aboard for his maiden score in August at Del Mar, will be back aboard. Midnight Pleasure won at first asking at Del Mar last summer and has struggled in three starts in stakes and allowance company since. He’s got potential, but an allowance race may be his best bet for a win. Term of Art is a Grade 3 winner who hasn’t done much when facing the better runners of the sophomore class. He’s a late runner who fortunately drew the rail, but he’ll need to improve a few lengths to be a factor. Comma Sister broke his maiden last out and looked good doing it from off the pace. This is an awfully ambitious spot to roll the dice in for a stakes victory, but I give them all the credit for trying. These are the same connections who own Grade 1-placed Win the Space. Kimbear also faces winners for the first time off a 4 ½-length win in maiden company in his sixth attempt. He’s earned solid numbers recently and has a nice pedigree, but he’s another whose connections have lofty ambitions. So Conflated won the California Derby over a synthetic surface and then was no factor in the Gotham last out, beaten 22 lengths. 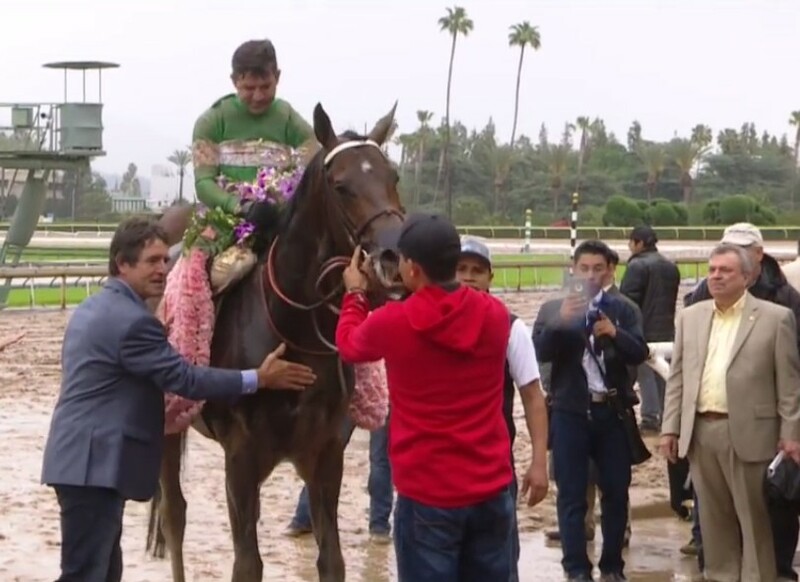 This race isn’t any easier, but he does have some well-known connections in two-time Derby winners O’Neill, Mario Gutierrez and owner Paul Reddam. That won’t be enough for a win, most likely, but he has them in his corner. Milton Freewater is O’Neill’s fourth runner and the state-bred stakes performer seems just a cut below these and would seemingly be better served returning to Cal-bred company.